All this week, RMHCA staff have been saying “Thank you!” to the amazing volunteers who make up the heart of our Ronald McDonald House. These talented and compassionate people give generously of their time to make guest families feel at home and to make our three charity-hostedSignature Events successful. We started the week with some sweet treats for our volunteers. Then, the staff and guest families wrote thank you notes and displayed them around the House so the volunteers could know how much they are appreciated. 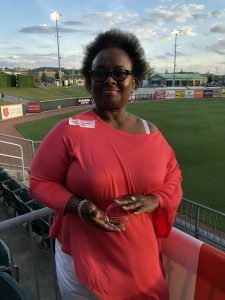 The week culminated in our annual Volunteer Appreciation Event, which took place at a Birmingham Barons baseball game. 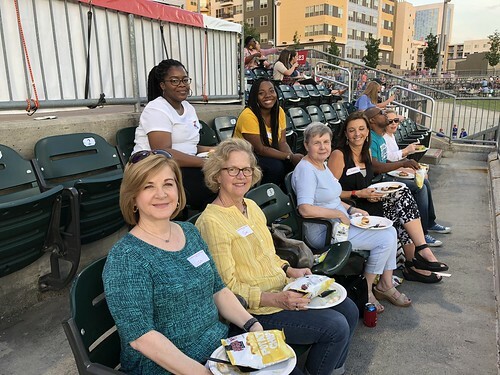 Volunteers enjoyed a cookout-style dinner and an exciting baseball game. This is also when we honored our outstanding volunteers for their service in 2018. No matter how our volunteers find themselves serving at our House or what area they serve in, the most common thing that impacts them is seeing how their time impacts families. Leigh Anne Terch won the Young Professional of the Year award. She brings the Art Cart out so families can craft, color or sculpt Play-Doh together. She says it amazes her to see how such simple activities can provide emotional support for children and rest time for parents. Leigh Anne Terch hosts Art Cart for two children and some parents. Our Volunteer of the Year Kerri Linley is one of the longest-serving volunteers in this year’s group. She has been helping at our Red Shoe Run for 10 years and has seen many changes over the years, but she says one thing stays the same. Helena United Methodist Church Dinner serves dinner. We have some of the best volunteers around because they feel a genuine call to serve, sometimes in honor or memory of a person who meant a lot to them. Brenda and her team from United-Johnson Brothers of Alabama are well-known among the guest families and staff for their delicious dinners and warm hospitality. Others, like Lisa Powell, want to relieve the stress guest families go through any way they can. We’re honored to recognize Crossbridge church as the Church Group of the Year for their efforts! “Each time we come to the house we are enthusiastically greeted by the residents. They compliment us on our meals and play BINGO with gusto. 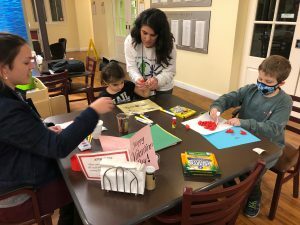 While we can’t change their circumstances we can change a moment in time and we love doing that,” said meal and activity volunteer Linda Wolfe said. 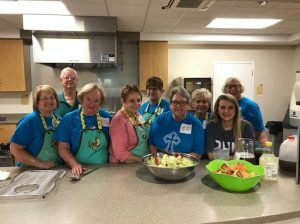 Her group from Helena United Methodist Church comes multiple times a year to uplift the families and that’s why they’ve won the Family Activity Favorite Award. Our group of volunteers are like family to the House and are always bringing friends in to help support the families! 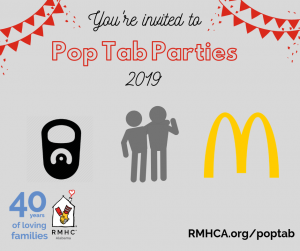 Sonja Bumper, who has served as a special events volunteer since the early 2000s, shared a wonderful story of how her love for RMHCA turned into a memorable project for her office. Her passion has earned her the Special Event Volunteer of the Year Award! Sonja Bumpers has been a longtime volunteer! Youth Volunteer of the Year: Riley Cooper, who leads the Hoover High School St. Jude Club. They have been providing meals for our families since December 2018. This group is comprised of high school students who give of their time and money to come monthly to provide a meal for our guest families. They plan great meals, prepare, serve and clean up every time with enthusiasm and love in their hearts. Riley has taken a wonderful leadership role in this position by leading other member’s faithfully to serve at the House. Thank you, Riley! Happy Wheels Hero – Tricia Raczynski. 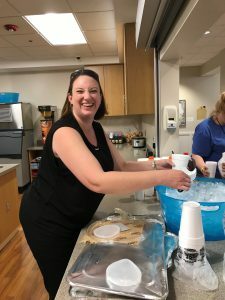 Tricia has been a supporter of the House for quite some time, but has recently began serving with our Happy Wheels Cart program that takes place in clinics 14 & 15 at Children’s Hospital. Tricia interacts with many adults and children there, making their day with a snack and activity book. She has also involved ladies in her church to support our NICU babies with hand-knitted outfits and hats. These treasured items are perfect for new moms to wrap their miracle babies. We appreciate everything, Tricia has done for our House and the Happy Wheels Cart Program! Kitchen Queen – Fannie Carillo. Fannie has served with the House since December 2016. Fannie is the meal group leader for La-Z-Boy Furniture Galleries – a faithful supporter of the House. Fannie takes great care and pours love into every meal that she prepares. La-Z-Boy employees always come to assist with the meal, service and clean up, but Fannie really shines bright with always going the extra-mile to make sure the food service is phenomenal for the families. We are so appreciative of the work she does to serve our families! Thank you, Fannie. Kitchen King – Eric Mussell. Eric has served with the House since September 2018. Eric serves weekly as a Kitchen Helper primarily assisting in kitchen & hospitality. Monday meal groups love him because he knows his way around, is able to assist where needed and always has a smile on his face. He is very personable with the families and always goes above and beyond to make sure their needs are met. The kitchen wouldn’t be the same without him. Thank you, Eric for your service! ADPi Chapter of the Year – University of North Alabama. Alpha Delta Pi’s national philanthropy is the Ronald McDonald House. We are grateful to have the support of the University of North Alabama’s ADPi chapter. This was their first year hosting two “signature” events as a chapter. Their spring event was called “A Night for Ronald,” and included a silent auction, music, and dinner for guests. They also hosted their very first Run for Ronald in the Fall of 2018, hosting over 80 runners and walkers. In addition to these, they hosted several smaller fundraisers to benefit our mission, raising nearly $3,000. We are so grateful for their support! We appreciate and are so grateful to all our volunteers! If you would like to join the “family” learn more on our Volunteer Page.